Every few months, the Nile Scribes bring you summaries of the latest news and discoveries in Egyptology, both from the field and the lab. We'll introduce you to the newest archaeological finds or recently undusted manuscripts being rediscovered in museum collections, plus other new theories stirring in the Egyptological Zeitgeist. In this edition, Graeco-Roman buildings were discovered in the Nile Delta and Siwa Oasis, new texts were revealed by the Sinai Palimpsest Project using multi-spectral imaging, and a beautiful set of Twenty-Sixth Dynasty canopic jars were excavated at the South Asasif in Luxor. Did you read the last edition on Discoveries from March & April? The Egyptian Ministry of Antiquities publishes a very helpful round-up of recent discoveries, events, and projects in Egypt in an accessible PDF format. The latest issue was published in May 2018 (English or Arabic). NS: A spectacular find has been made near the Pyramid of Unas at Saqqara: a new tomb belonging to an official who worked under Sety I and Ramesses II was discovered by an Egyptian archaeological team. The surviving blocks reveal the vivid colours and artistic style of the Ramesside Period and are a lasting testament to the prestige that the official, Iwrkhy, held throughout his career. "Professor of Egyptology at Cairo University Ola El-Aguizy has announced the discovery of an important tomb belonging to the great Ramessess II era General Iwrkhy in Saqqara, in a speech delivered to attendees of the Faculty of Archaeology Prom 2017. The tomb was discovered in the New Kingdom necropolis south of the Causeway of King Unas in Saqqara, during the last excavation season in 2017/2018. El-Aguizy, head of the mission that uncovered the tomb, said it most likely dates to the reigns of both Sethi I and Ramesses II. The site has yet to be fully excavated, but has already provided a wealth of material testifying to the high status of its owner and his family." 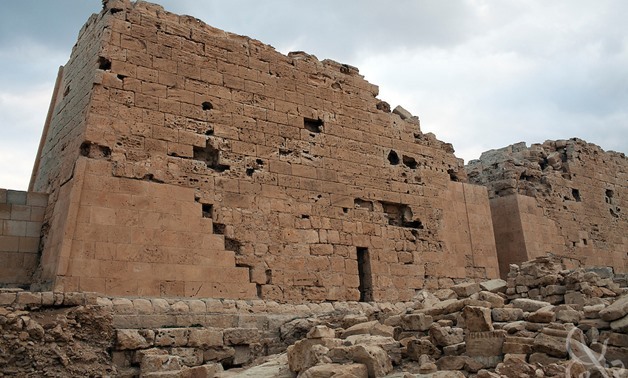 NS: An Egyptian archaeological mission working in Siwa Oasis discovered the remains of a temple dating to the reign of Roman Emperor Antonius Pius. Among the finds was a large limestone fragment with Greek inscriptions. "In what is proving to be a fruitful year for ancient Egyptian archaeology, the Ministry of Antiquities announced the discovery of another Roman temple near Siwa oasis on Thursday in an official statement. The Egyptian archaeological Mission of the Ministry dated the remains to the second century or, more specifically, the reign of Emperor Antonius Pius. The site on which they made their find was located at Al-Hag Ali village near Siwa Oasis." NS: Egyptologist Thomas Schneider recently analysed a limestone ostracon found in the tomb of an Egyptian official named Senneferi (TT 99) by members of the Cambridge Theban Tombs Project. He assessed that the text, written with hieratic script but seemingly in a Semitic language, formed a mnemonic phrase using words organised in a similar fashion to that of the Latin alphabet. "Whoever wrote these inscriptions 3,400 years ago may have been trying to remember the start of both alphabetic sequences, Schneider said. Sennefer was an official who dealt with Egyptian foreign affairs and likely understood the Semitic languages that were used in the Eastern Mediterranean, Schneider said. When Sennefer's tomb was being constructed, perhaps the scribes helping to build the tomb were trying to learn the languages, and one of them wrote these words down as a practice exercise, Schneider told Live Science." NS: At the site of Tanis in the eastern Nile Delta, an Egyptian mission has unearthed a red brick building. The team has interpreted it as a bath from Graeco-Roman times and hopes to continue uncovering more of the structure in following seasons. Also among the finds was a gold coin of Ptolemy III. "An Egyptian Archaeological Mission from the Supreme Council of Antiquities has uncovered Parts of a huge red brick building during excavations carried out at San El-Hagar archaeological site at Gharbia Governorate. 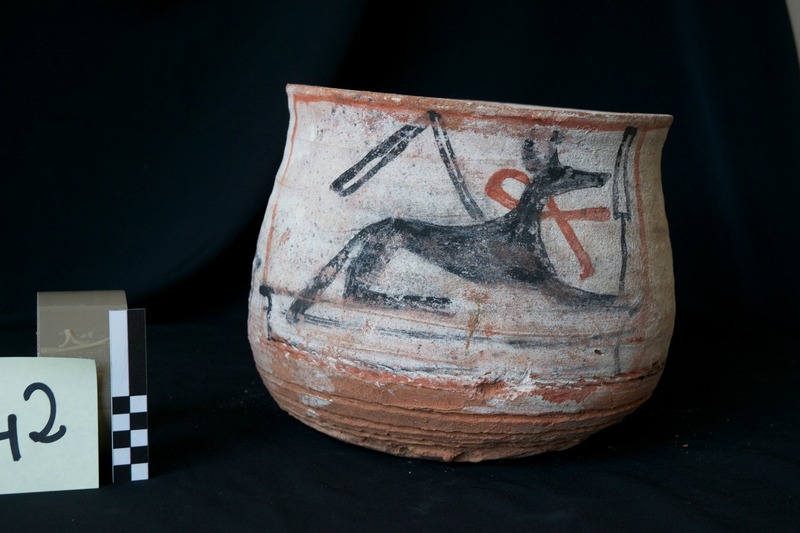 Dr. Ashmawy continues that the mission also found pottery vessels, terracotta statues, bronze tools, a stone fragment engraved with hieroglyphs and a small statue of a ram." NS: The Sinai Palimpsest Project researching the collection of liturgical manuscripts at St. Catherine's Monastery has been using multi-spectral imaging to discover older inscriptions that were scrubbed clean by monks wishing to reuse the parchment. Of the 4500 manuscripts in the collection, 170 of them have proven to be palimpsests. "Now, each page is photographed 33 times using 12 different wavelengths. The images are analysed using computer algorithms, and several images are combined to make the undertext more legible. If this doesn't yield results, the page is analysed using statistics: each pixel is assigned a value, separated into categories, then manipulated according to those categories to make that selection more visible to the human eye." NS: The Elkab Desert Archaeological Survey Project at Bir Umm Tineidba have discovered clusters of Predynastic rock art near tumulus burials, as well as stone structures comprising a Late Roman settlement that dates to c. 400-600 CE. These two finds , separated by an enormous amount of time, shed further light on habitation in the Eastern Desert areas. "The mission discovered a wealth of archaeological and epigraphic material, including numerous concentrations of rock art, primarily of the Pre-Dynastic and Proto-Dynastic periods; burial tumuli of the Proto-Dynastic period; and another thus-far unrecorded Late Roman settlement. John Coleman Darnell, head of the Yale University team, said that the mission found three rock art sections revealing important scenes of the Naqada II and Naqada III Dynasties (ca. 3500-3100 BCE), providing evidence for the continuity and interaction of artistic styles of the Eastern Desert and Nile Valley." NS: At the Third Intermediate Period tomb of Karabasken in Luxor's South Asasif, a subsidiary burial belonging to "the lady of the house, Amenirdis" has recently been excavated. Her complete set of alabaster canopic jars were found in a canopic niche and bear the heads of the Four Sons of Horus: Imsety, Hapy, Duamutef, and Qebehsenuef. The jars still contain traces of resin and also bear an inscription dedicating them to the lady Amenirdis. "Mostafa Waziri, the secretary-general of the Supreme Council of Antiquities, told Ahram Online that the jars were found in situ in an intrusive burial compartment cut into the south wall of the pillared hall of the tomb (TT391). They were found in a 50cm-deep space in the floor. "Although the jars are in situ in a very good conservation condition, they had fallen over the time under the pressure of flood water and one of them was broken into several fragments," Waziri said, adding that emergency cleaning and consolidation were carried out by the ministry's conservators." Nile Scribes made it to Prague this week to attend the 2018 Current Research in Egyptology conference. Held in the "Golden City" this year, the conference attracts graduate students in Egyptology and related fields as well as early career researchers from mainland Europe and around the world. What began as a post-graduate conference in the UK in the early 2000s expanded outside the island in 2010, when it was hosted in Leiden. This year's conference took place at the prestigious Charles University. After the keynote, the congregation moved over to the Institute, where three concurrent sessions were organised. I was "lucky" to be the among the speakers of the first session, and I presented an aspect of my doctoral research on the current work that is being done to determine possible sources of lapis-lazuli. It was a friendly audience – they were very engaged and I was asked excellent (but tough) questions. In a subsequent talk, Perrine Poiron spoke to us about her doctoral research and traced the development (and eventual importance) of the title "son of Bastet" within the context of Twenty-Second Dynasty royal ideology. One of the last talks that day took us to Saqqara, where Vincent Oeters spoke to us about discoveries made by the mission, of which he was part. They had found a large stela belonging to an official named Tatia – a large chunk on the top right was missing. He explained that they have found many stela fragments over the few seasons prior and were then lucky to match the missing chunk to the stela. The stela itself was discovered to fit perfectly within an empty spot within Tatia's chapel – what a discovery! Vincent Oeters then looked deeper into the family tree of Tatia and surmised that he most likely is the brother of the famous vizier, Paser, who was active during the reigns of Sety I and Ramesses II. "Don't believe what's written in the books… They're not always right!" In another instance, which has stayed with me, he responded to a question about what was on top of Mentuhotep II's mortuary temple: "Is it really important to reconstruct what was on top of Mentuhotep II's Mortuary Temple?" After all, he said, there are more important issues! Cloé Caron from the Université du Québéc au Montréal/Montpellier examined the cosmological concept of Nu and highlighted in particular her "dreadful concept." She found that it actually embodies two forces: a dreadful force on the one side (antagonistic), and a desirable on the other. The Nu encloses an area of liminal transition between the world of the mundane and the sacred. Vera Michel then from the Universität zu Wien examined many of the deposits and deposition pits found across area R/III at Tell el-Dab'a. Miniature vessels were commonly found and she evaluated their use within ritual contexts – were these part of any household cults? The evening's last keynote by Dr. Jana Mynářová unravelled the importance of textiles within the international correspondence between Egypt and her neighbours throughout the New Kingdom. While Egyptian textiles seem to not have been desired by their counterparts in the Mesopotamian region, they would actually become an important element in trade with the Aegean world, including Arzawa in Western Anatolya. CAIRO – 30 June 2018: On the Mediterranean coast of the northern Delta near Lake Mariout, about 45 kilometers to the west of Alexandria, is the town of Abusir. The city's ancient name was "Taposiris Magna". Abusir dates back to the Ptolemaic era and includes several ancient Egyptian monuments, such as the Taposiris Temple, which was a religious shrine built for Isis, and a lighthouse that resembled the Lighthouse of Alexandria. Taposiris Temple was established by Pharaoh Ptolemy II Philadelphus between 280 and 270 BCE. Huge slabs of limestone, extracted from ancient quarries that are now still in the city, were used to build the monument's walls. According to Greek biographer Plutarch, the temple denotes the tomb of Osiris, which is the translation of the name. Most of the remains of Taposiris Magna today date from the Graeco-Roman Period. The temple also contains bronze artifacts related to the worship rituals of Isis: a jug, lamp, balance, statues and vases, all of which date back to the Roman Ptolemaic period. An ancient church was also found inside the temple, and gold coins dating back to the Byzantine period were found near the temple. Abusir lighthouse is similar to the Lighthouse of Alexandria, especially in terms of size and that it followed the same architectural style. The lighthouse consists of three main floors and there are stairs which were destroyed and restored in the modern era. Recently, some scholars believed that the lighthouse was a large old mausoleum and some believed that it was a lighthouse used for maritime purposes. Abusir developed during the Byzantine Emperor Justinian era (527-565 CE). Many bathes, markets and houses were built during the period. The emperor also built a government palace for the prosperity of the city market. The director of Alexandria Antiquities, Adly Rushdi, affirmed that Abusir is one of the cities rich in antiquities. He also said that the Egyptian expedition discovered statues of Cleopatra and another statue that was the spokesman of the emperor at that time, which was placed as the first statue of the Bibliotheca Alexandrina. A collection of 195 artefacts and 21,660 coins were returned to Egypt on Friday after being seized while being smuggled into Italy in May. The artefacts were returned in collaboration with the Carabinieri Command for the Protection of Cultural Heritage in Rome and the Italian Public Prosecutor at the Court of Salerno. 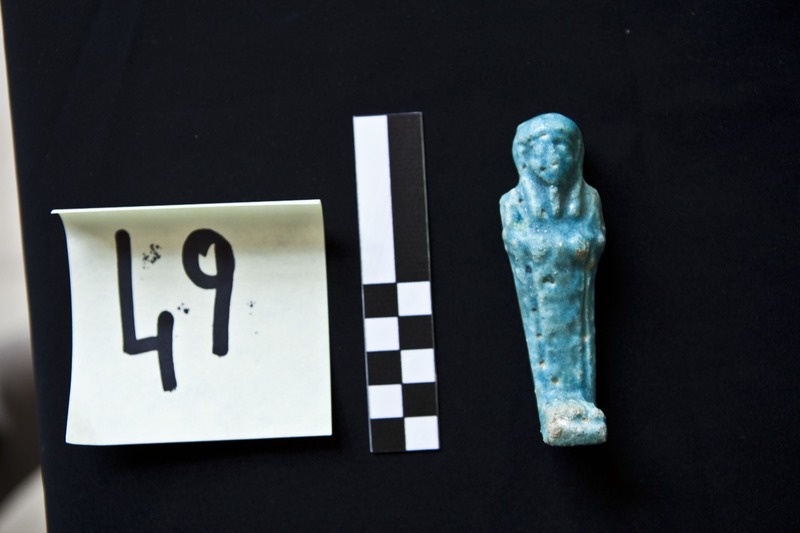 Secretary-General of the Supreme Council of Antiquities (SCA) Mostafa Waziri told Ahram Online that the recovered objects are dated from Ancient Egypt to the Islamic period. The artefacts include 151 ushabti statuettes carved in faience, 11 pots, five cartonnage gilded mummy masks, a wooden sarcophagus, two symbolic wooden boats of the dead, two canopic jar lids and three porcelain tiles from the Islamic era. Waziri also thanked Italian authorities, the Egyptian prosecutor-general, Egypt's Ministry of Foreign Affairs and the Egyptian Embassy in Rome for their efforts in ensuring that the artefacts are returned. 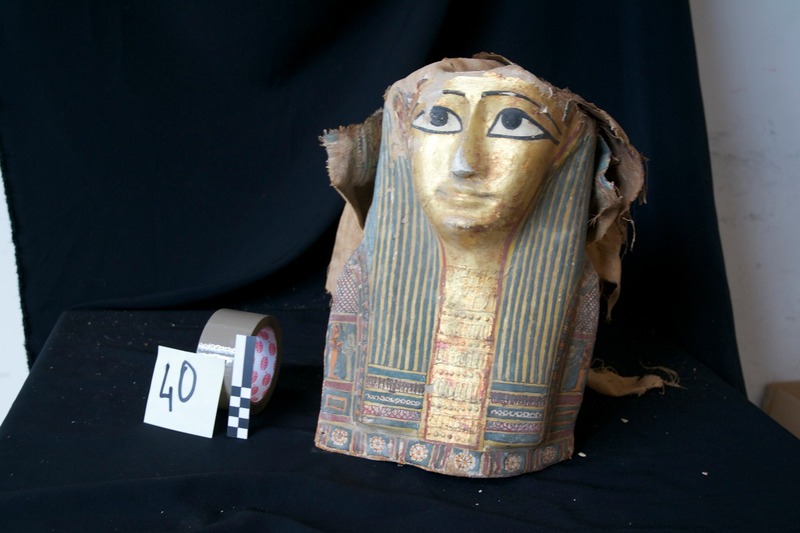 "The return of the artefacts was executed in an unprecedentedly short period after Italian authorities reported the incident to Egyptian counterparts," Waziri said, explaining that the usual repatriation process in such cases can take three to five years. Waziri said that when the incident was reported to Egypt's antiquities ministry, Minister Khaled El-Enany formed an archaeological committee to inspect photos of the artefacts and called for an urgent meeting of the National Committee for Antiquities Repatriation to discuss the matter and take all the necessary procedures to return the artefacts to Egypt. The committee is led by El-Enany, and its members are comprised of renowned Egyptian archaeologist Zahi Hawass, former Arab League Secretary-General Nabil El-Arabi, as well as representatives from the Ministry of Foreign Affairs, the prosecutor-general, and legal and security authorities. 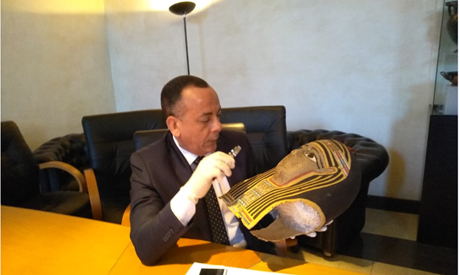 In mid-June, Waziri and Mohamed Ezzat, senior coordinator at the International Cooperation Administration of the prosecutor-general's office, travelled to Salerno to inspect the artefacts and confirm their authenticity. "According to the Ministry of Antiquities' records, the objects were not stolen from any museum or store gallery in Egypt," Waziri asserted, adding that the artefacts are now undergoing restoration and will be put on display in a temporary exhibition at the Egyptian Museum in Tahrir. Over the past two years, Egypt has succeeded in repatriating 975 stolen artefacts from 10 countries. 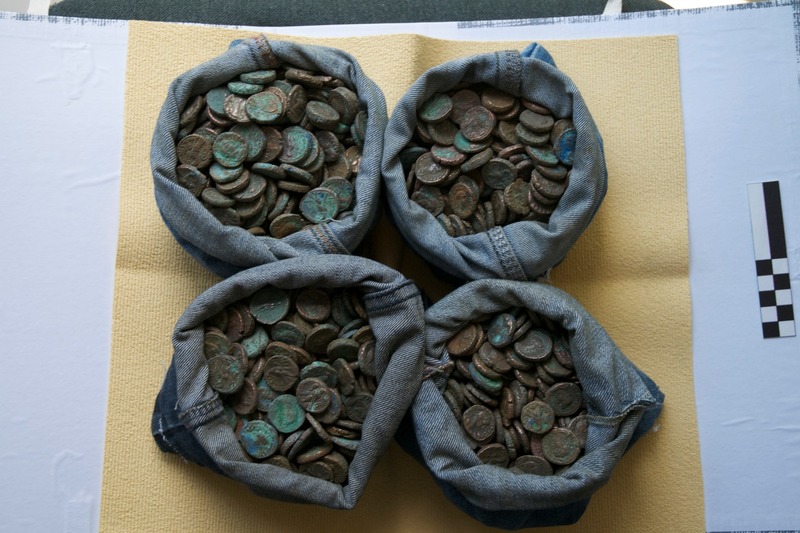 Smuggling antiquities seems to be one of the most profitable illegal businesses worldwide. Egypt possesses millions of highly valuable and universally admired artifacts, and has always had a smuggling problem. The current tendency to favor government megaprojects while overlooking the importance of ancient Egyptian antiquities to the development of our country has encouraged many to engage in the illicit trafficking of antiquities, a practice that has been increasing substantially, especially in the last few years. Apparently, Egypt is sitting on a treasure trove of precious antiquities — those that are housed in our museums seem to be only a fraction of what lies beneath our land. The illegal excavation of antiquities is happening in many parts of the country, with a relatively high success rate. Meanwhile, as it focuses on projects that might help to feed citizens in the future, the government is paying less attention to protecting and promoting our antiquities which, if better managed, could provide us with more revenue today. Known as the "city of a thousand minarets," Cairo contains a large number of recognized historical mosques, many of which are spiritually associated with millions of Muslims around the world. The same goes for our churches; the "Hanging Church" and the "Cave Church" are internationally renowned. The areas around these places of worship only need tidying up to make them more appealing to visitors. Yet the government recently constructed the largest mosque and church in Egypt, in the new, relatively uninhabited administrative capital. The Italian government's recent discovery of 23,000 ancient Egyptian artifacts concealed in a diplomatic container truly shocked Egyptians. The great number of artifacts, along with the "official medium" used for smuggling them, made it obvious that the illegal trafficking of antiquities is a well-organized and powerful business in Egypt. Had it not been for the Italian government's seizure of the container, those ancient pieces would be for sale on the black market today. The recent partial opening of the Grand Egyptian Museum, which cost about $1 billion (funded by the Japan International Cooperation Agency) was a historic move by Egypt to provide a proper home for 100,000 ancient Egyptian artifacts. However, the government, which was not even able to produce an attractive logo for the museum, is still searching for a suitable company to manage and run it — a task that should have been completed prior to the inauguration of the museum. Many nations whose antiquities are certainly less valuable than ours are significantly more knowledgeable about the protection and promotion of antiquities than we are. Egypt needs to assign these nations as the caretakers of our antiquities to better display them to international visitors. The Egyptian government applies a double-standard pricing policy to museum and temple visitors: Foreigners are charged an "international" entry fee that must be paid in hard currency, while Egyptians pay very modest fees in the local currency. This pricing policy could induce Egyptian citizens to underestimate the value of their antiques. The government should consider offering Egyptians a single, once-in-a-lifetime free entry ticket to museums to enable them to learn about their history. Citizens who value ancient antiquities should then be required to pay the international fees for any subsequent visits to museums or historic sites. Our government has still not provided proper professional management for the astonishing monuments and artifacts built by the pharaohs thousands of years ago — this kind of shunning of our history has prompted several nations to falsely claim that the ancient civilization of the pharaohs does not belong to us. Minimal effort is needed to better protect and promote our ancient history, which could potentially generate billions in revenues. Instead, we have entrusted the management of our most valuable antiquities to a handful of bureaucrats, some of whom are engaged in smuggling. The Egyptian government needs to be extremely firm with antiquities smugglers. This is more a matter of enforcing existing laws than promulgating new ones. Many nations whose antiquities are certainly less valuable than ours are significantly more knowledgeable about the protection and promotion of antiquities than we are. Egypt needs to assign these nations as the caretakers of our antiquities to better display them to international visitors. • Mohammed Nosseir, a liberal politician from Egypt, is a strong advocate of political participation and economic freedom. 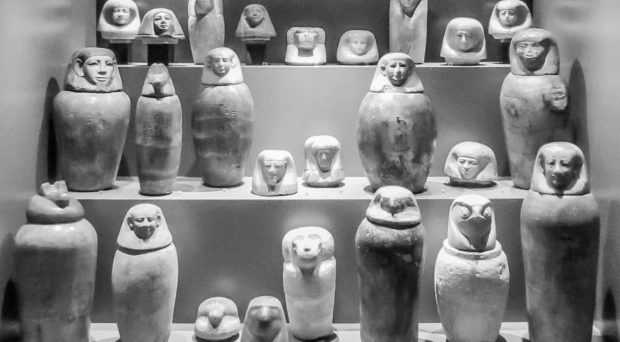 "Surprisingly, ancient Egyptian canopic jars – containing precious mummified human internal organs – have been widely neglected in biomedical research so far. This despite their unique value to contribute to the understanding of the ongoing evolution of diseases", says Prof. Frank Rühli, Director of the Institute of Evolutionary Medicine and senior author of this study. Unexpectedly, radiological analysis also led us to socio-cultural findings: Contrary to Herodotus' texts, which represent some of the oldest sources on ancient Egyptian mummification procedures, probably not entire organs were kept in the jars, but rather small organ fragments. Most measured canopic jars showed insufficient holding capacities for an entire human organ, even after desiccation. 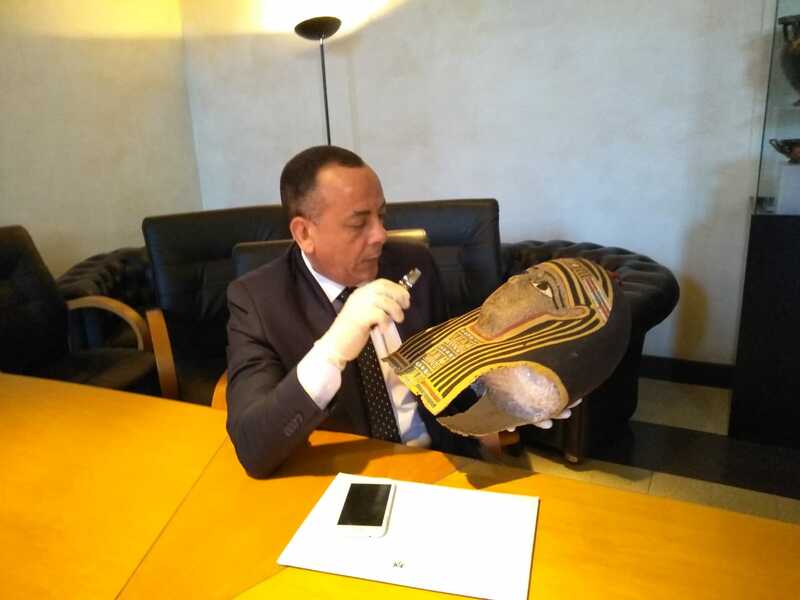 A collection of Egyptian artefacts seized by Italian authorities last May are set to be returned to Egypt in the next few days, Egyptian Minister of Antiquities Khaled El-Anany said on Wednesday. 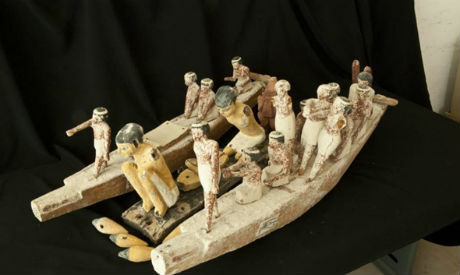 According to statements reported by state-owned MENA news agency, El-Anany said during a cabinet meeting that the artefacts, which were seized as they were being smuggled into Italy, will be delivered to Egyptian authorities in the European country on Wednesday. In May, Italian authorities seized in Naples 23,700 artefacts, which include 118 ancient Egyptian items. Egypt has dismissed reports that the cache of artefacts was discovered in a container belonging to an Egyptian diplomat. According to officials in Egypt's Ministry of Antiquities, the objects were stolen from illegal excavation sites, as there are no records of the artefacts in Egyptian museums. The artefacts include a collection of pottery from different ancient Egyptian eras, as well as parts of sarcophagi and coins. Also among the artefacts were objects from Islamic Egypt. Egyptian authorities have said that from March 2016 to May 2018, Egypt recovered more than 975 artefacts that had been smuggled to 10 different countries. CAIRO – 27 June 2018: Haitham el Hag Ali, president of The General Egyptian Book Organization (GEBO), revealed that the entity is working to re-print the book "Wasf Masr" (Describing Egypt) in celebration of the Egyptian-French cultural year 2019. He further stated that nine parts of the book remain missing in the stores of the organization, and the remaining 27 parts were sold years ago. Ali further stated that once the nine parts are found, the remaining parts of the book will be re-printed to be ready for the public by 2019. Furthermore, Ali stated that parts of "Wasf Masr" (Description of Egypt) can be found in the Golden Jubilee of Cairo's Book Exhibition. The parts ready for re-printing will be printed in the presence of the inheritors of writer Zoheir al Shayeb, who translated 13 parts of the famous book. It is worth noting that the translation project for "Wasf Masr" started in 2004 and ended by 2009. "Wasf Masr" Encyclopedia also includes paintings that require decoding. This is one of the causes of the delay of the re-printing process. An original copy of the book was destroyed after the Egyptian Scientific Institute was burned down during riots in 2011. France's Napoleon Bonaparte arrived in Egypt with more than 160 historians, artists and scientists during the French campaign in Egypt between 1798 and 1801. 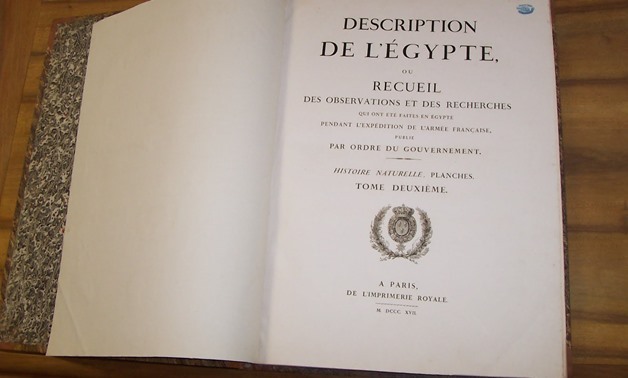 However, French General Jean-Baptiste Kléber, who was in charge of the campaign after Bonaparte left Egypt after only one year, is the one who formed committees to study all aspects of the Egyptian society to document their findings in a book celebrated until today. The book was collected between 1803 and 1828. It included more than 3,000 paintings depicting various scenes of Egypt and was promoted as a major scientific, literary, historical and artistic work that refuted many old assumptions about Egypt and spared future generations of much work to discover secrets of the ancient country. 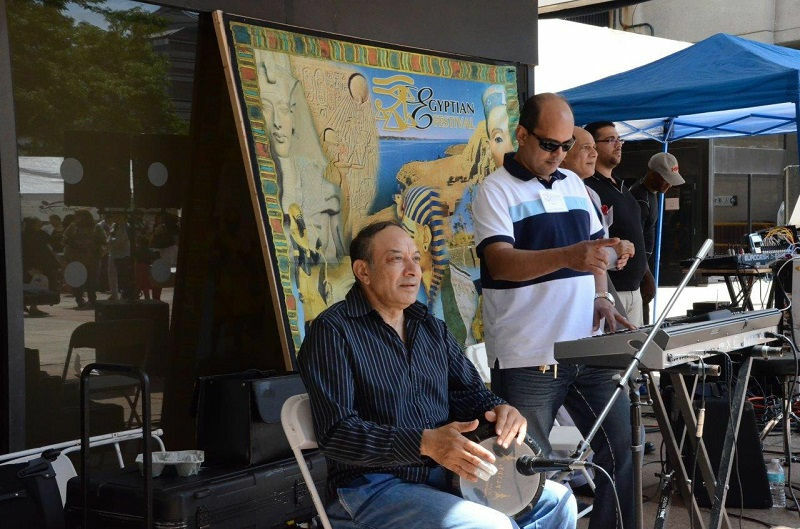 Journal Square will be the center of attention for Jersey City's 11th annual Egyptian Festival on June 30, from 12 p.m. to 8 p.m. The 2018 Festival will take place at Pedestrian Plaza, 9 Path Plaza, Jersey City. 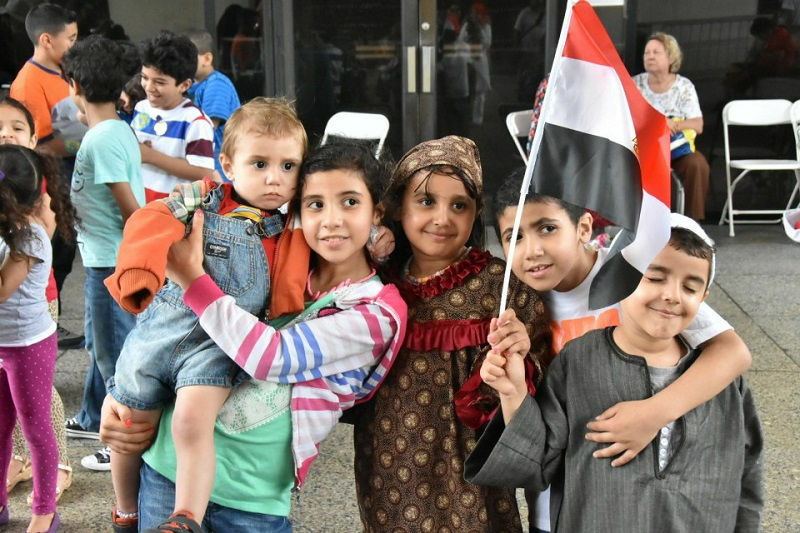 The day long celebration will include both Egyptian and American food, traditional live Egyptian music, face painting, and even a live karate show. The festival will celebrate all things Egyptian and give people a chance to learn about public services and free resources available to the community. Posters drawings, paintings, and other tapestries will show off both ancient and modern day Egypt. 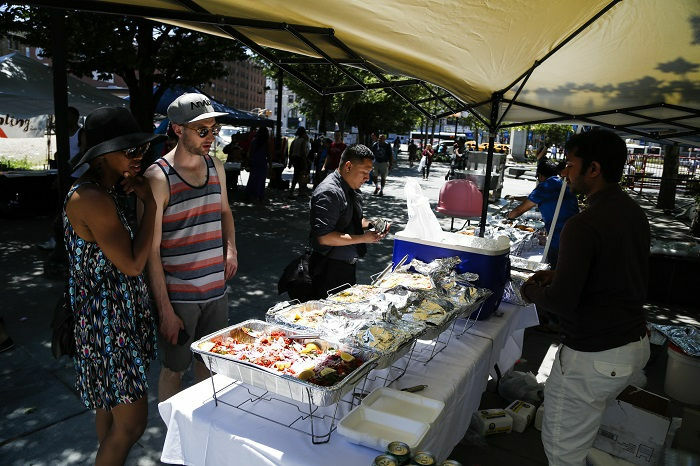 The event is sponsored by Bakka Crop, a non-profit organization that works to promote educational resources within the Egyptian and Journal Square communities. 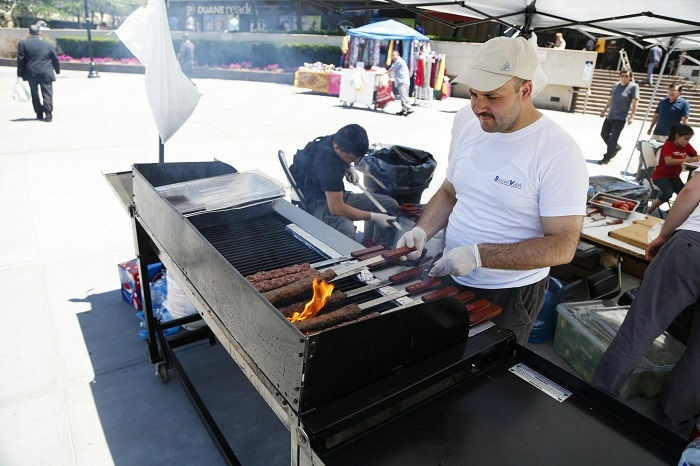 Bakka Corp has organized the Jersey City Egyptian Festival for the past decade. CAIRO – 25 June – 2018: Reinterpreting Phharaonic icons into contemporary designs, designer Shaimaa Kamal, who won the International Product Design Award in 2016 thanks to the glory of Pharaonic design, has succeeded to revive the buried Ancient Egyptian art and attract the world's attention to Egypt's great heritage of design. "As long as our civilization remains trapped in museums, books and documentaries without being introduced to people's daily life whether nationally or internationally, we will never be aware of its greatness. But, resurrecting it makes us remember our roots," Kamal told Egypt Today. 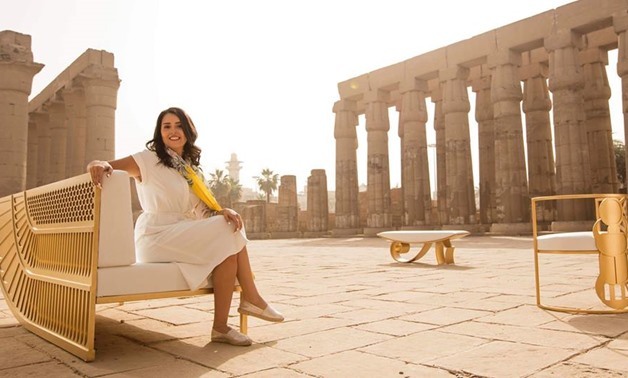 Because of her eagerness to revive Egyptian heritage in a way that fits the modern era and shows the world the glory of Ancient Egyptian art and design, Kamal designed in 2016 contemporary Pharaonic design in style, the wing sofa, which later nabbed the International Product Design Award from the world's professional designers. In January 2016, she began to design the wood-painted gold wing sofa, which was presented in May 2018 alongside other pieces from her Pharonic furniture line at the great Luxor Temple where she got her inspiration. This came as a part of Cairo Bank's advertisement for Ramadan this year to shed light on young people who succeed in building something different. To redesign the wing image found on Tutankhamun's chair in a more modernized way, she abstracted the original design from all its colors, making the wing's lines sharper and straight, made of wood-painted gold, at the sofa's back. In the meantime, she designed a basic and silent front without any decoration to make the wing "the hero of the design" and serve its greatness. According to the piece's description, the sofa's used materials are wood-painted in copper for the back and pure white leather for the seat to communicate the luxury and the causality of the pieces. Upon completion, the wing sofa design competed with the world's pioneering designers' in the 2016 International Design and Architecture Award. Although she has entered many competitions, she says this competition was very special to her as only one designer who can receive the award as opposed to the case with other competitions; hence, it is very challenging, revealed Kamal. Besides, the International Design and Architecture Award is unique in targeting global ordinary audiences as the award is not judged solely by a professional jury. The shortlisted entries are presented online, after being chosen by the jury, to get the acknowledgment of ordinary customers and clients in the vote along with professional designers as well. Kamal believes that her piece was chosen among many other international designs to win the award given global thirst for Ancient Egyptian civilization. The sofa is the first attempt to revive Ancient Egyptian culture and create uniqye, contemporary Pharaonic design, she added. She further remarked that she owes the 50 percent of the credit to the original designer, who created it 4,000 years ago, and the other 50 percent to the modern designer, who has reinterpreted the wing into a modern style. After winning the competition, she completed her Pharaonic furniture line of a 10-piece collection, including the wing sofa, with each piece reflecting a single icon such as the scarab, Horus' eye, the key of life or the snake. Kamal formerly studied business at the German University in Cairo and worked in marketing at Unilever. However, she found this path unfulfilling and sought to pursue her lifelong interest in design. A trip to Milano, Italy, changed her life as she accidentally saw a fly at the airport announcing that the Iraqi-British architect Zaha Hadid, the first female winner of the Pritzker Architecture Prize in 2004, had established a new center of art in Milano. "At first, I did not know Zaha Hadid, so I decided to google her to know more about her. Upon being introduced to her works, I felt there was something common between us; both of us are Arab women who love art. So, I quit when I returned from Italy and went off for a year to study Interior and Furniture Design at the Florence Design Academy in Italy." It was during her time pursuing graduate studies that she decided to interpret Pharonic Egyptian motives and culture in a contemporary way. "Most of my designs are Pharaonic as when I was in Italy, I felt depressed that my studies included all design styles of the world's civilizations, except for Ancient Egyptian style although pharaohs were the first to excel at designing." Upon returning to Egypt, she opened her own company, Shosha Kamal Design House, aiming to pursue her entrepreneurial drive. 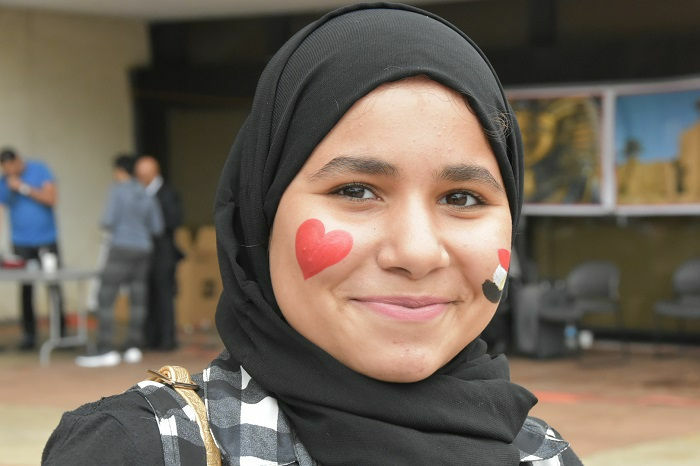 The first project she took up upon her return from Italy was renovating the exterior of a former American University in Cairo building in Downtown, the iconic Greek Campus now serving as a startup hub. Inspired by the diversity of human beings, Kamal brought two civilizations and different eras together; she maintained the building's historic glamor of the Greek architectural style and introduced, at the same time, figures of Pharaohs climbing the building in a race toward its highest point. "The Pharaohs resemble youth's daily efforts, trying to reach highest levels of success," she said. Meanwhile, pop art blended the modern world with the past found in the ancient building style. Hence, the climbing pharaohs were colored with red, yellow, blue, orange and green, she says. "This project is what I most proud of, as it was made for the 57357 hospital; it is a great honor for me to design something that the kids would see every day and distract them from their pain." Shaimaa said that Dr. Shreif Abu el-Naga, the vice president of the Children's Cancer Hospital 57357, asked her in 2015 to collaborate on a project that would honor the late Sheikh Zayed Bin Sultan Al-Nahyan for his generous contributions to the hospital. The award-wining interior designer decided to honor him in an Egyptian way. "When Pharaohs honored someone, they linked his existence to the sun, so I followed their tradition." Kamal worked on the design and execution of the memorial its for three years in collaboration with a including sculptress Rossana Corrado and the head of mechanicalEdward Nokash. The final product is comprised of a flock of 75 pigeons forming the face of Sheikh Zayed. "The memorial moves twice a day; once at sunrise, to symbolize his birth, and another at sunset, referring that Sheikh Zayed has left our world, but his goodness still surrounds us… the memorial reflects that Sheikh Zayed is born from the greatness of sun and the prosperity of pigeons." A composition by acclaimed musician Omar Khairat plays for sunrise, while one by musician Hisham Kharma plays at sunset. The memorial is characterized by its beauty, and was inaugurated in early 2018. Kamal Pharaonic furniture line is slated for release by the end of 2018.